Michigan is one of the states located in the area of Great Lakes. The name of the state comes from native language of Ojibwa tribe: “mishigamma” what means "large water" or "large lake. Michigan is the only state in the USA that consists of two peninsulas, both of which are connected these days by the Mackinac Bridge. Frankly, having almost 65 thousands islands, lakes and ponds Michigan is a “Water State”. 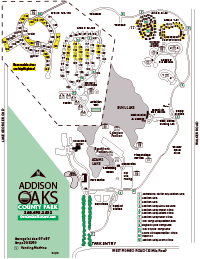 Addison Oaks is a beautiful park where you can stay with your RV and have a nice time. It has 1,139-acres of land and two mesmerizing lakes. The park has sandy beach and waters open for swimming, boating, and fishing. You can rent here a rowboat or a pedal boat for these activities. During winter season you have here opportunities for ice fishing and ice skating. Hiking is another activity that you can enjoy here. There are more than 13 miles of trails for hiking and mountain biking, and if you do not have one with you, you can get them from the park’s rental office. During winter these trails are perfect for cross-country skiing. Addison Oaks County Park is also suitable for special events and occasions like weddings, banquets, receptions and business meetings: they have a very stylish Tudor-style conference center. 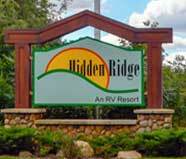 Hidden Ridge RV Resort is a campground located in the countryside of western Michigan, where you can enjoy events and organized activities all year long. The RV Resort has a lot of amenities that make it a comfortable place: DVD rentals, fishing supplies, paddle boats rental office, restrooms with hot showers, laundry room, grocery store, enclosed dog run and for RVs - a self-service wash station and dump station. For those practicing everyday gym, the resort offers an exercise room. The park is quite large with 277 parking spaces, but they are all located in a peaceful area and lake Grebe is right there for you to enjoy it even more. Summarizing - if you like water sports, then Hidden Ridge RV Resort offers plenty of water activities. This RV Park is ideal for the entire family. There is plenty of opportunities for outdoor activities. The beautiful Michigan beaches, fishing & golfing spots are irresistible. Some pets are also allowed, but please check pet restriction before coming. The Vacation Station RV resort has a heated swimming pool and a spa as well. You can rent paddle boats from the park as well as find fishing supplies there. There is trash pickup at site, a shuttle service, pedal carts and available WiFi on the whole area of the campground. And short news for addictive shoppers – there is plenty of shopping opportunities…. If you stay here you will be close to the peaceful Michigan beaches & the shifting sand dunes. But this is not all - the RV Resort is located next to Hunter Creek, where you can do some fishing. The park has a heated pool, a wading pool and a spa as well. There are tables at the sites for you to enjoy your meal outdoors. Silver Creek RV Resort is quite big with 268 sites including 119 paved sites with full hookup service and 20 pull-through sites. The park has impeccable restrooms and hot showers. 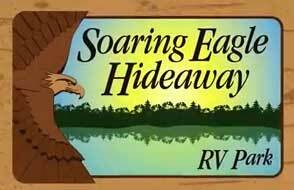 Soaring Eagle Hideaway RV Park is located conveniently next to a 25 acre lake. The Grewes Lake has a dock right next to the campground and the best is that boats can be rented right from the campground. But the lake on top of its scenery also offers romantic sunrise and sunset opportunities. As if it is not enough of water – the Soaring Eagle Hideaway RV Park has a heated pool, wading pool, sauna and hot showers which a lot of people just love. Moreover the park has an exercise room, game room, golf course, pavilion and playground to enjoy indoor and outdoor activities. During the summer season, the RV Park also offers a lot of planned activities designed for the whole family. Take a trip to upper Michigan, take the lakeside highway for some views of the beautiful lighthouses, and camp somewhere inland for some wonderful views of the falls around the area. The directory of campgrounds: tent and RV camping parks Michigan (MI) has some campgrounds in lower and upper Michigan. Take a pop up camper, mobile home or any other recreational vehicle and explore everything this state has to offer. A directory of campgrounds: tent and RV camping parks Michigan (MI) includes state parks and a beach camp for the motor home traveling family. Any area of the upper part of Michigan is perfect for touring in a motorhome trailer as well as a tent. These tent and RV campsites leave a lot of room for sight seeing in the area while also enjoying some relaxation in the wilderness.